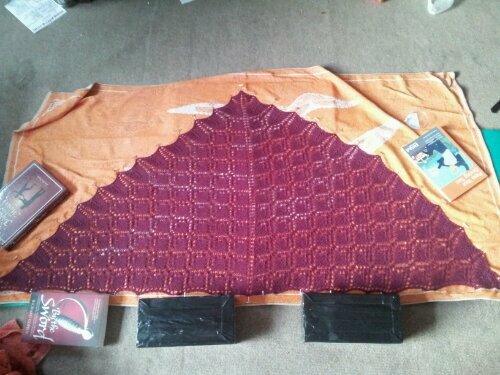 The Trinity Shawls by Anniken Allis. 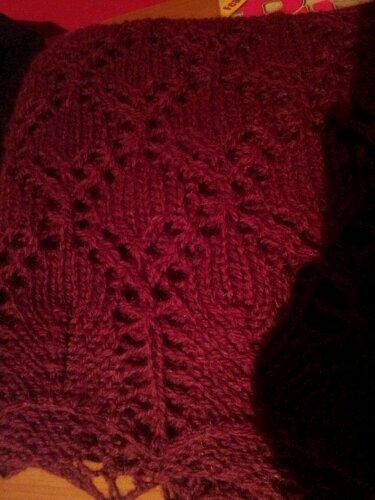 Sirdar Balmoral in Banquet Red and Buckingham Blue. 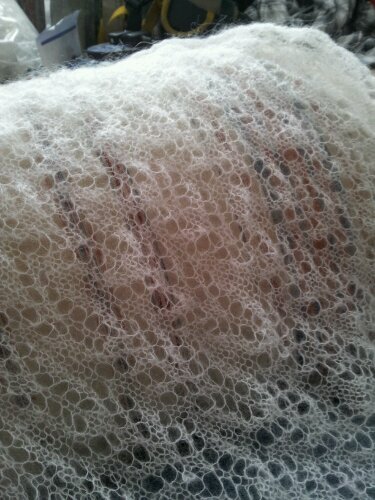 This is a very simple pattern that makes such a beautiful shawl when complete! 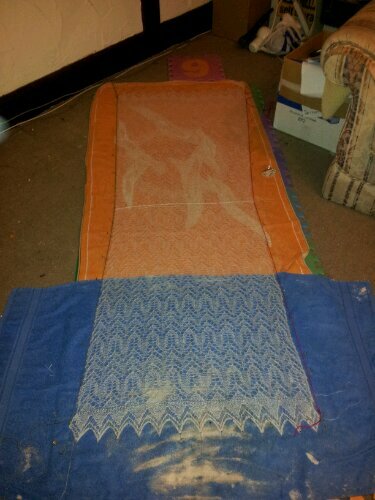 These took about 3-4 days of on and off knitting to make, then 2 days to dry with blocking. 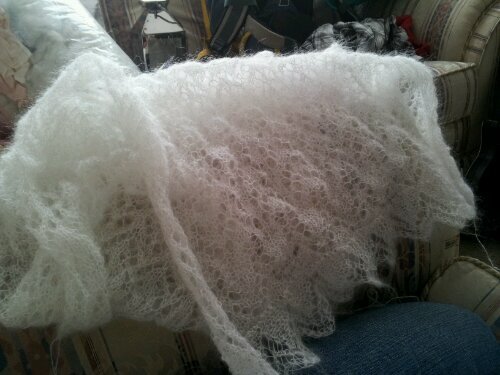 I was seen to be knitting these while I was stewarding for DigitFest a couple of weekends ago. I wore the red one to the Big Chip Awards 2011 last week – it went wonderfully with my corset and skirt combo! This will be worn with my wedding dress on the “big day”. 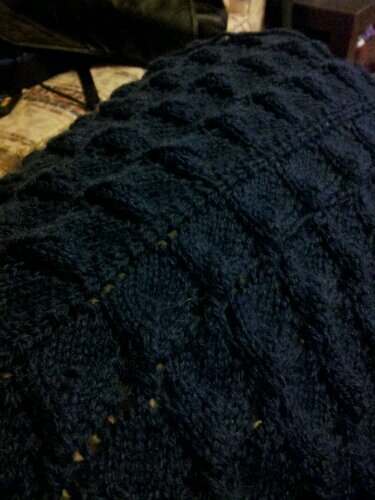 It has taken me since the beginning of April to knit this. I’ve never knitted such fine yarn and I also managed to knit one half of it completely wrong(yarn backwards, rather than forwards – it’s very time consuming trying to keep that extra twist in there)! It is currently blocking (drying under tension) on the living room floor. I’ve had to use thread woven through the edge stitches and those are then used to pin out to get the tension even throughout. 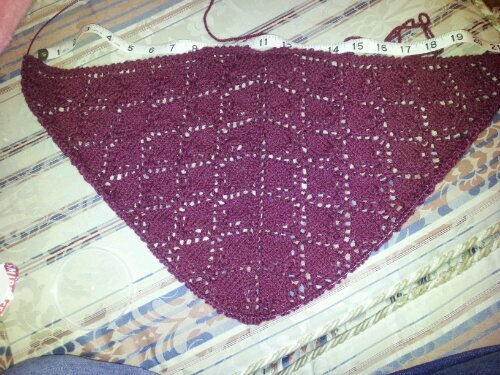 I have found that, yes, blocking is vitally important to the finished shawl. 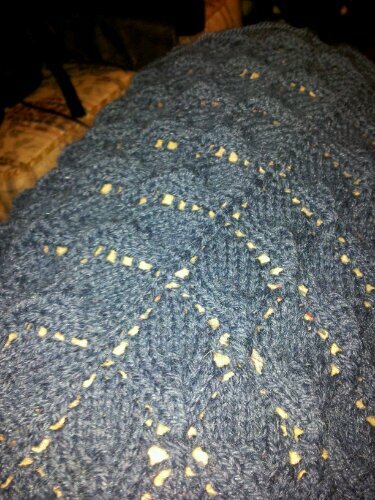 You need to pull those yarn overs and decreases out so that you can see the full pattern and make it wearable. 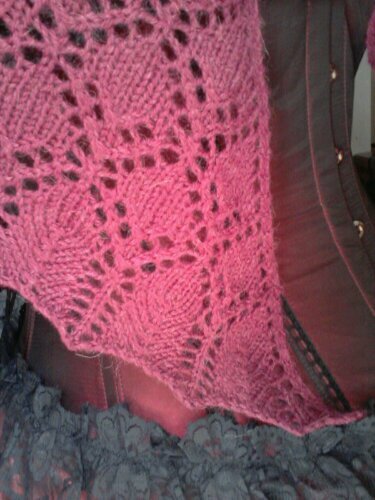 As you can see with the photo of the red shawl, when first knitted in DK they seem rather small (only measuring 22-24″ on the longest edge compared to 55″ when blocked). 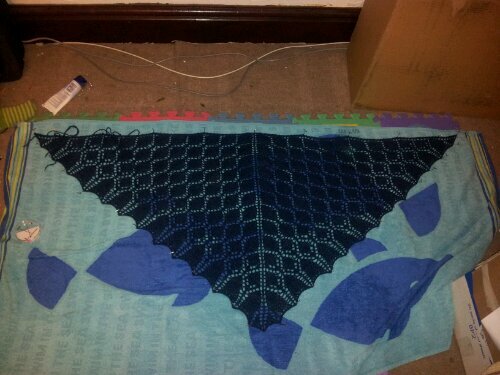 In the blue shawl you can also see that the pattern is prone to being bumpy when left to its own devices, these are all resolved with blocking. All in all these have been wonderful exercises in patience, especially the Sweetwater Wrap. All are worth the time and effort I have put in. Great lessons learnt. A very big thank you to Anni and Ruth at The Little Knitting Company for the help and wonderful patterns. 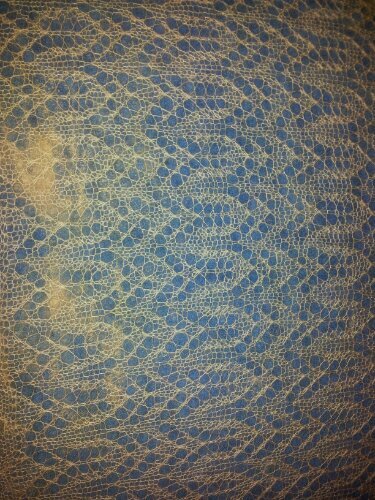 The dressing of the shawl makes all the difference, and you can appreciate the patterns. I do all kinds of knitting and always enjoy a challenge. Best wishes for your Big Day..